Leonard Myles-Mills is a former Olympic sprinter who competed in both the 2000 Sydney Olympics and the 2004 Athens Olympics. In the 2000 Games, he made it to the semifinals of the 100-meter dash and finished ninth overall. In the 2004 Games, he qualified and competed in the 4x100-meter relay and 100-meter dash. After posting a season-best time of 38.88, his team took sixth. In the 100-meters he advanced to the semifinals and ran a 10.22, barely missing the finals. Prior to competing at the Olympics, Myles-Mills was a two-time NCAA men’s 100-meter dash champion for Brigham Young University. In 1999 he recorded one of the best seasons in the history of BYU track. Not only did he defend his 100-meter outdoor title (1998, 10.20 seconds), but he was also the indoor 60-meter dash NCAA champion and the anchor to the outdoor 400-meter medley relay team that finished third, making Myles-Mills a four-time All-American for his college career. he also won the same four events in the Western Athletic Conference championship that season. His NCAA-record time of 6. 45 in the 60-meters stands as the fastest performance in NCAA history. He was inducted into the BYU Hall of Fame in 2009. Myles-Mills, born May 9, 1973, in Accra, Ghana. He won a silver medal at the 2003 All-Africa Games, a gold medal at the 1999 All-Africa Games, and a bronze medal at the 1998 African Championships. He set a new African indoor record in the 60-meters in 1999 (6.45 seconds). 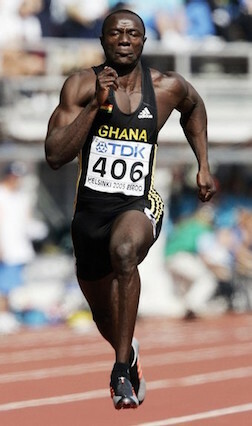 He holds the Ghana record for the 100-meter dash (9.98 seconds). He earned his bachelor’s degree in sociology from BYU and became the sprinting coach in 2001. He is the men’s track assistant coach. Myles-Mills is a member of The Church of Jesus Christ of Latter-day Saints. He and his wife, Tiffany, are the parents of three children. This page was last edited on 3 March 2017, at 14:27.